Sales of memory ICs are expected to show the strongest growth rate among major integrated circuit market categories during the next five years, according to IC Insights’ new 2017 McClean Report, which becomes available this month. The 20th anniversary edition of The McClean Report forecasts that revenues for memory products—including DRAMs and NAND flash ICs—will increase by a compound annual growth rate (CAGR) of 7.3% to $109.9 billion in 2021 from $77.3 billion in 2016. The 2017 McClean Report separates the total IC market into four major product categories: analog, logic, memory, and microcomponents. 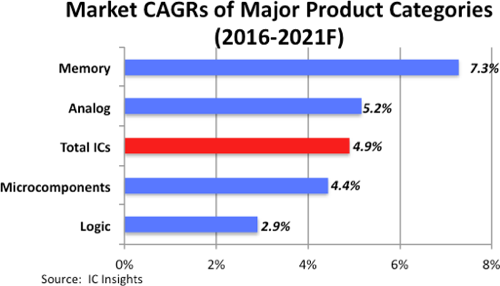 Figure 1 shows the forecasted 2016-2021 CAGRs of the four major IC product categories compared to the projected total IC market annual growth rate of 4.9% during the five-year period. As shown, the memory IC category is forecast to show the strongest growth rate through 2021 while the weakest increase is expected to occur in the logic category, which includes general-purpose logic, ASICs, field-programmable logic, display drivers, and application-specific standard products. The strong memory CAGR is driven by surging low-power memory requirements for DRAM and NAND flash in portable wireless devices like smartphones and by growing demand for solid-state drives (SSD) used in big-data storage applications and increasingly in notebook computers. Moreover, year-over-year DRAM bit volume growth is expected to increase throughout the forecast to support virtualization, graphics, and other complex, real-time workload applications. Analog ICs, the second-fastest growing segment, are a necessity within both very advanced and low-budget systems. Power management analog devices are critical for helping extend battery life in portable and wireless systems and have demonstrated strong market growth in recent years. In 2017, the signal conversion market is forecast to be the fastest growing analog IC category, and the second-fastest growing IC product category overall, trailing only the market growth of 32-bit MCUs. Total microcomponent sales have cooled significantly. Fortunately, marginal gains in the cellphone MPU market and strong gains in the 32-bit MCU market have helped offset weakness of standard PC and tablet microprocessor sales.